Now that Lightning Experience is enabled in your environment, it’s time to make your custom app, Dreamhouse Classic, available to your Lightning Experience users. If you’re just getting started with Lightning Experience and want to explore what your Classic App will look like, we can do this with just a few clicks. However, while this is a fast and easy way to make your Classic App visible in Lightning Experience, it’ll still have some limitations. Later on we’ll finish our Lightning Experience transition by creating a brand-new Lightning app for Dreamhouse. First, switch to Lightning Experience for yourself, so you can start exploring and building. When you enable Lightning Experience for yourself and your users, all users will still have the option to switch back and forth between Lightning Experience and Salesforce Classic experience from the profile menu. In your Lightning Now DE, click Switch to Lightning Experience. 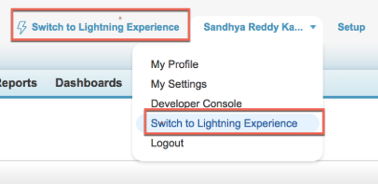 Note: You can also click your name in the menu, and select Switch to Lightning Experience. Now we’ll make our Classic App visible in Lightning Experience and we’ll also add some additional navigation bar items. This doesn’t impact the app experience for our Salesforce Classic users, it just makes the current Classic App visible in the App Launcher for our Lightning Experience. There is also an option in the App Manager to “Upgrade” your custom app. We don’t use this in the project, but this lets you create a new Lightning App as a clone of your Classic App. From Setup, enter App Manager in Quick Find and select App Manager. Click the dropdown menu icon for the Dreamhouse Classic app and select Edit. Check the Show in Lightning Experience box (this may already be selected by default). With just a few clicks you’ve made your Classic App visible in Lightning Experience. In the next step, we use this app to check out features in Lightning Experience.